The Feature Wall is a classic way to add a bit of flair to any room in your home. It can add a dramatic touch to an otherwise neutral space. 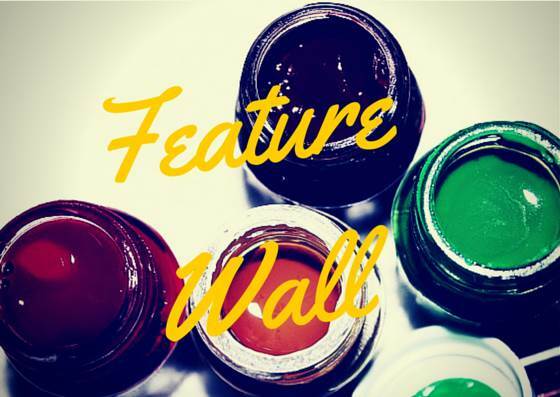 There are loads of ways you can create a feature wall, but the traditional approach is painting one wall a dark, vibrant or eye-catching colour. When picking the wall you want to paint, consider where people in the space would normally face – such as behind a television in a living room. This is our guide on how to create a paint effect feature wall through marbling dark paint into a light surface. Make certain that both the brush and the roller are made of quality materials; you don’t want any stray bristles in your finish coat! You will also need to choose two colours of paint; a base colour and a slightly darker top coat. Keep in mind that you will require a base coat in a semi-gloss finish and a top coat that can be either matte or flat. Use latex paint for your base coat and oil paint for the top coat (we will see why a bit later). Be certain to calculate the amount of paint that you will need for each; it is always better to have a bit of an excess as opposed to not enough. Tape off any trim, window edges and other obstructions that may be present. Next, apply two coats of the base paint (latex) to the wall. Make certain that the paint covers the wall evenly and that no gaps are left around the edges. This normally takes two coats although a lighter colour over a darker shade can take up to three. Allow this paint to dry overnight. Take the darker colour (the oil finish) and thin the mixture out in a separate container (the ratio is normally one part thinner to three parts paint). Dip a crumpled rag in the solution and then begin pressing this painted cloth on top of the base coat that will have dried overnight. Thinned oil paint is used due to the fact that it will take longer to dry and then you can modify the texture before it sets in place. This creates a marble pattern that you can change to suit your tastes. Press harder for more distinct lines and lighter if you desire a “blurred” effect. Finally, be sure to work the rag around the edges of the wall (this is the reason for the tape). After the top “rag” coat dries, simply remove the tape. This is an easy way to create a truly stunning feature wall over a weekend. Remember that if you are unhappy with the final pattern, you can simply paint over it and begin again! Previous Article Three Quick (and Easy!) ways to Keep Your Kitchen Sparkling Every Day.